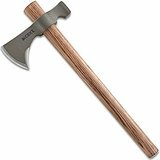 The Columbia River 2730 RMJ Woods Chogan T-Hawk Tomahawk with Hammer is a tomahawk even Daniel Boone would have loved to have as he walked through the wild lands of America. 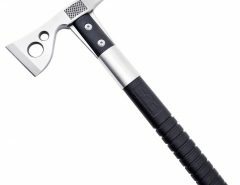 It is beautifully made to resemble an old model tomahawk but made out of modern indestructible materials. It is made in the United States by Ryan Johnson from RMJ Tactical, which designs knives, axes, tomahawks, air guns and the like. 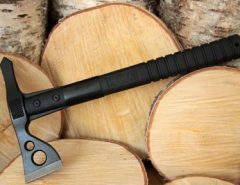 The Tomahawk has an overall length of 19.13 inches and weighs two pounds. The blade is 4.21 inches and has a width of 0.52 inches. The blade is made out of 1055 heat hardened stainless steel and is made from one single piece of metal giving it extraordinary strength and durability. Its RC stands between 50 and 55. It is equipped with a primary and secondary edge bevels which make it versatile and gives you a cutting edge choice. The handle is made out of beautiful Tennessee hickory, one of the hardest woods found in North America. It is almost white wood which creates a very nice contrast with the nasty blade above it. The Tennessee Hickory is sealed with water-proof lacquer which protects it from water and the elements. If you will be swinging your tomahawk often it may be a good idea to have a rubber cover made for the handle to improve your grip and get a better hold of the tomahawk when you strike with it. The blade is dull silver and they also have a great leather sheath for it but unfortunately it is not included in the package. Besides the two edge bevels which are curved and ground to provide you with more balance and a good striking zone on the other end it has a hammer which you can use to pound your stakes into the ground if you have any nails with you, well, go ahead and build a log cabin if you want. The hammer is perfectly balanced with the weight of the blade so that when you throw the tomahawk it stays right on target, right side up. We took this baby out into the woods to make sure we were not giving you the wrong information and it worked like a charm. It is excellent for wood cutting for the fire and even for bogs and branches we used to make a roof to protect us from the rain. Good cutting edge and great weight distribution allowing for relaxed work and little strain while striking with it. Throwing the tomahawk may require a little practice because we kept hitting the tree with the wrong end but that is just probably our lack of experience. In general it is a great tool to have with you when camping because it is perfect for regular jobs like wood cutting and the hammer has the necessary weight to sink your tent stakes too. 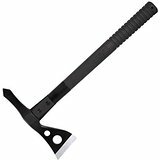 Simply put, because it’s performance is great, it comes at a great price and looks like a traditional tomahawk it’s one of my favorite tactical tomahawks. We used it for five or six days as a camping hatchet to chop wood and to make ourselves a kind of roof where we could hang out while we cooked and relaxed in the sun and it did its job perfectly. When we got home the blades were as good as new and all we did was clean it and put it away for our next trip. It’s a really good option for a survival backpack. If you’re looking for a smaller tomahawk that you can throw faster, check out my SOG Fasthawk review.